Three Milds, a Strong Ale and a Bitter. Tetley’s range wasn’t huge when WW II kicked off. Note that they didn’t brew a Stout of any description. Which is odd, given that it was still a popular style in bottled form. I suppose they must have supplied their tied houses with another brewery’s Stout. K had been around since at least 1868, though the early versions were very different. They had a similar gravity to the 1939 version, but were extremely lightly hopped. I really don’t know what style you’d call it. Then in the 1880s it was transformed into their second-string Pale Ale, with pretty decent hopping. Though, at 10 lbs per quarter of malt (336 lbs), still well short of PA’s 16 lbs. WW I killed off PA and K continued as Tetley’s sole Pale Ale. With an OG in the high 1040º’s, K would have counted as a standard Bitter between the wars. It probably retailed for 7d per pint, in a public bar. There’s not much to the recipe: pale malt and sugar. The latter being something called ARC. No idea what that was so I’ve substituted No. 1 invert. The malt was half English, half Californian. The hops were slightly different from their other beers: all Kent from the 1937 and 1938 harvest, most kept in a cold store. I guess they left the stout to Guinness? Looks like a cheap knock-off of Boddies - interesting to see a golden ale outside Manchester, do you see many of them in Yorkshire pre-WWII? I get the impression that Tetley Pale Ale was well-regarded. Perhaps another brewery stocked bottled Tetley Pale Ale in their tied estate in exchange for Tetley stocking their bottled stout? A reciprocal deal would have made more sense if perhaps Tetley was using its own brewery to full capacity, and preferred to focus on its pale ale and mild beers, rather than brew relatively small amounts of stout. Tetley were extensive bottlers by this time. I don't know if they were engaged in bottling bulk Guinness, but if they were would they be subject to certain rules which restricted them from brewing their own stout? It's a lot nicer than Boddingtons, there's no Adjuncts for a start!! And the good brewers at Tetley's weren't almost fermenting out and priming up 😬. 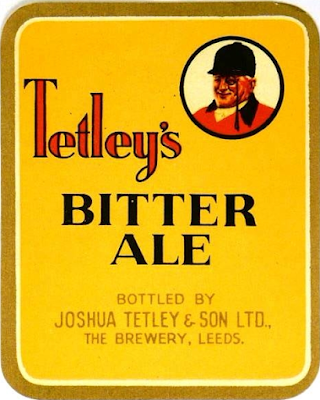 Bentley's Yorkshire Breweries were producing a "Golden Bitter Ale"
Tetley didn't use to bottle Guinness. In Leeds all the Guinness was bottled by Musgrave & Sagar, a former brewery that still owned a few pubs and did bottling. or they could have got Stout from another brewer, for example Whitbread. Do we know when Boddies IPA first appears? Thanks. So it's possible that golden ale is actually a Leeds thing that was stolen by the Mancs? And as I suggested over on Edd's blog (or maybe it didn't post? ), I wonder if the whole Golden Ale thing might have its origins in Victoria's golden jubilee in 1887? It's the sort of heretical gimmick that brewers would do for a big event like that, and then find that people actually liked it. Sorry,not seen a comment /post of that ilk 😤.